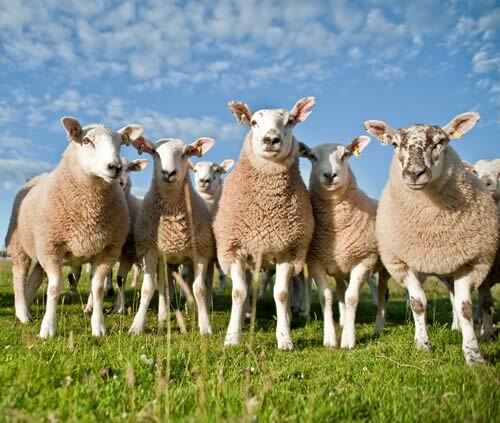 The percentage of British lambs reaching the target ‘R3L or better’ carcase quality specification remained stable in 2013 at 57.6%, up 0.1% from 2012, according to the latest figures released by EBLEX. The results, which show the percentage of lambs meeting the specification required by the main markets, are based on Agriculture and Horticulture Development Board (AHDB) data from 144,551 lamb classifications undertaken independently by Meat and Livestock Commercial Services Limited (MLCSL) in British abattoirs. However, closer analysis of the data shows the proportion of old season lambs with a classification of ‘R3L or leaner’ has increased by 2.2%, but the proportion of new season lambs at ‘R3L or leaner’ has dropped from 60.1% in 2012 to 58.8% in 2013. Difficult spring weather, which resulted in additional creep feeding of lambs, may have contributed to them becoming fit quicker than expected. There is still, however, concern that some producers are holding on to their lambs at some times of the year, while waiting for market prices to rise. 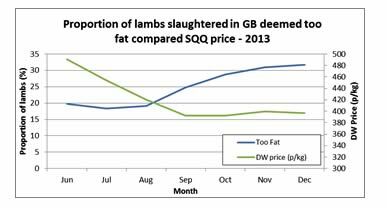 In November and December 2013, over one in four lambs that classified as ‘R or better’ were classified as fat class 3H or above. Fat deposition requires four times the amount of energy needed to produce lean tissue, such as muscle. Lambs in the correct condition for their designated market will maximise returns. Frequent, careful handling of stock is essential to ensure each animal has reached its target specification. Information on breeding, feeding, management and selection for slaughter is available from the EBLEX Better Returns Programme and free BRP Live to Dead days are held regularly at abattoirs across England.